Chef Mel's modern take on old-world vegetarian street food: Elevating vegetables from the side dish to the main dish. Featuring locally-sourced vegetarian dishes, a fresh juice bar, and small-batch provisions, cultivated by farmers of the future, Urban Pastoral. Mel is a renowned and accomplished Chef and Food Entrepreneur. She is the guiding force and visionary behind Urban Pastoral's culinary vision and hospitality strategy. She was named Executive Chef at age 21, and by the time she turned 25, opened 4 highly successful restaurants, including Nickle City Tap House, Birroteca (2 Locations), and most recently Encantada, which featured a seasonally inspired, locally sourced vegetarian menu. Her artful and versatile style is influenced by her Italian heritage, but nuanced by urban culture. Remington Chop - Brings together food lovers to eat, drink, and learn from the neighborhood's best chefs and brewmasters. We've lined up an afternoon filled with culinary workshops, live music, and a pop up biergarten. Buy a ticket and select your workshop, and you'll receive three drink tickets and access to the biergarten all afternoon. 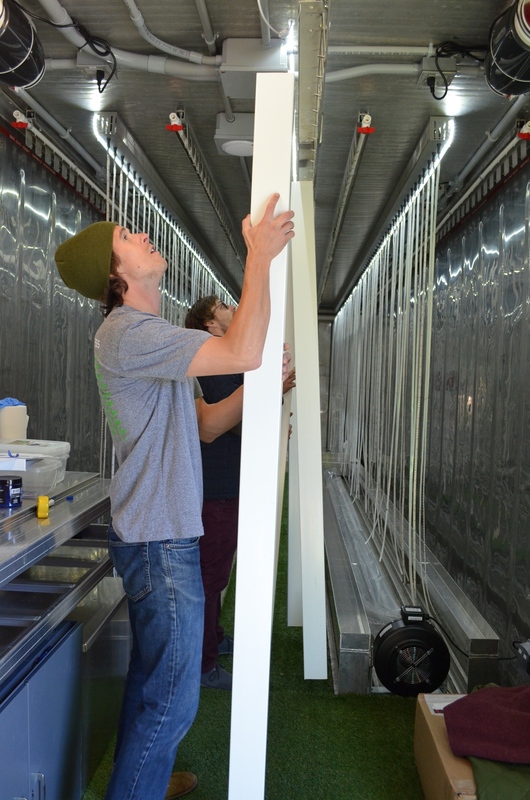 Hydroponic Farming & Juice Pressing Workshop (1-2pm) - Who is a farmer, and what is a farm? These are two questions that many urban food entrepreneurs are addressing as the landscape of our cities evolved over the last century. Today, Urban Pastoral, and their collective of entrepreneurs, engineers, chefs, and developers, are challenging our perceptions of farm to fork, by rethinking our localized food economy. They are not your average farmers, and their farms are not your typical fields of corn. In this workshop you will learn how to grow like farmers of the future. You will have the opportunity to seed and plant hydroponic towers, and then make freshly pressed juices using live greens, with a surprise, Baltimore grown chef. J.J. had the opportunity to sit down with Patrick Rife from Startup Soirée to chat about the role of food system sustainability in Baltimore's urban Renaissance. Startup Soirée is an incredible organization that connects entrepreneurs from across Baltimore to fuel collaboration, and build networks. The Urban Pastoral Team just returned from an incredible month in Milan, Italy, showcasing our company at the World Expo. 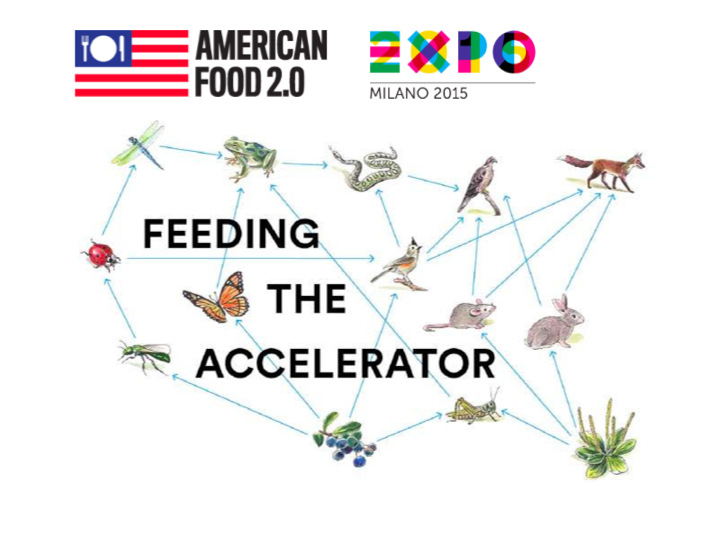 Urban Pastoral was 1 of 10 teams selected to participate in the USA Pavilion's hallmark Innovation Program, "Feeding the Accelerator." The notion of how our planet will sustainably feed 9 Billion people in 2050 is extraordinarily complex. Therefore, the U.S. State Department teamed up with the James Beard Foundation, Microsoft, FedEx, and urban design firm, Atelier Slice, to leverage the forum of the Expo to pinpoint entrepreneurs from around the globe who were tackling this problem from vastly different angels. At its core, innovation is the intersection of multidisciplinary minds. It creation occurs through friction, and illusory barriers collapse. To capture this notion, Savinien Caracostea, Atelier Slice Partner, and Curator of Feeding the Accelerator directed a film titled, "Mentor Minds," which is a series of short interviews with thought leaders from a wide range of fields discussing creativity, food, architecture, and expression. Savinien also filmed the entrepreneurs who brought all of these concepts together in the manifestation of their businesses, demonstrating the philosophy behind Feeding the Accelerator. Our team had the opportunity to engage the conversation around food in the global arena. We collaborated with world renowned chefs, architects, investor, government leaders, and tech innovators to better understand our business model in a multidisciplinary construct. It was an incredible opportunity to be involved in such an incredible gathering, and the amount of work that went into this Expo was astonishing. However, the work is just beginning, and we are creating a legacy of innovation so that the Expo will not simply be remembered as an event, but a nexus for global change. UP is 1 of 10 food-tech entrepreneurs who will work with innovators from around the world to redefine our global food systems. Below is a trailer of "Mentor Minds," featuring the mentors who will be working closely with UP and the FTA cohort through September, in Milan, Italy. June 8th, Humanim Social Enterprise, City Seeds, held the #MadeinBaltimore Vendor Fair, at the historic Lexington Market. The fair connected local food businesses with prominent institutional buyers such as Johns Hopkins, MICA, and the City Government. There was an eclectic group of food entrepreneurs, ranging from coffee roasters and bakeries like Zeke's and Dooby's, to juicers and fermenters like Gundalow and HEX. Mayor-Rawling-Blake was also in attendance, interacting with the vendors and speaking to the audience. The Mayor, along with City Seeds Director, Deborah Haust, spoke about the importance of buying local and stimulating the Baltimore economy. Food entrepreneurs are not only feeding the city, but also creating jobs and empowering local communities. UP had a blast showcasing our Vertical Farming wall, and demonstrating to the crowd how we will change the landscape of urban food production in Baltimore. We were also excited to announce the launch of our first modular facility, BoxUP. We partnered with Humanim, American Communities Trust, and the Abell Foundation to demonstrate next generation urban food production on the site of the Baltimore Food Hub. BoxUP plans to be operational by the end of the summer. J.J. had the honor of being selected to represent Urban Pastoral as both a Social Impact Lab Speaker and an Innovation Prize finalist at the Unite for Sight, Global Health & Innovation Conference this past weekend. 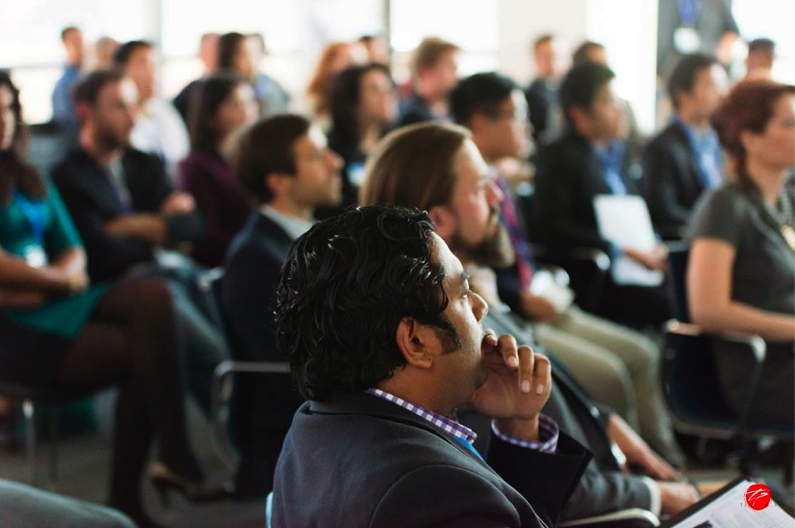 The 12th annual conference, hosted at Yale University, brought together thought leaders in Medicine, Healthcare Innovation, Public Policy, International Development, and Social Entrepreneurship, from across the globe to engage in an interactive open dialogue with over 800 participants. The conference began primarily as a medical themed forum 12 years ago, and has evolved into an expansive discussion that explores the social determinants of health through many different lens. Healthcare innovation was a prominent topic throughout the conference, but one could not help but notice that themes of tied to agriculture, nutrition, and environmental sustainability seemed to permeate through every discussion. There was a shift from surgical techniques, and advanced technology to preventative care and human centered design. J.J. began the first day of the conference delivering a talk on the importance of urban food production. On his panel was Joe Whinney, Founder & CEO of Seattle Based fair-trade chocolate company, Theo Chocolate, and Rodney North, spokesperson for Equal Exchange, a worker owned co-operative dedicated to conducting fair-trade business around the globe. This year, Unite for Sight launched the GHIC Innovation Prize to award social innovators $15,000 in grants to help facilitate an impact project. Over 200 applicants went through multi-rounds of submissions, until the competition was paired down to 22 semi-finalists, who have to deliver a 2-minute pitch in front of industry judges and over 350 conference participants. Our pitch was 1 of 6 selected to move on to the finalist round, where J.J. engaged in a 5-minute presentation and 20 minutes of questions with judges and audience members. The prize was one by Yale'13 Alumna Lucy Topaloff for her concept MiracleFeet, which created a low-cost solution to treating clubbed foot disorder. Although, Urban Pastoral did not walk away with the prize, it was a tremendous honor to share our company, and interact with such bright social entrepreneurs. UP had the opportunity to attend TEDxManhattan this past weekend, and interact with some of the most influential global thought leaders in food system sustainability. This incredible event has been engaging the question of how our world must "Change the Way We Eat," for the past three years. TEDxMan continues to bring together innovative and driven people who not only share a passion for food, but a belief that food and its origins can and should be a vehicle for social, economic, and environmental change. What was so special about TEDxMan was the scope and diverse backgrounds of all of the speakers and attendees. There were scientists, photojournalists, chefs, farmers, doctors, political activists, investors, students, restaurateurs, and musicians; all from vastly different fields, but all sharing the common thread of food. This global conversation facilitated by TEDxMan, illustrates how food permeates through all facets of society, and how we all, no matter what vocational or social distinction, must take responsibility in restoring health and sustainability. The conference began with opening remarks from celebrity chef, and food activist, Tom Colicchio, on how food policy must be at the forefront of political action. He explained how it is his mission to have stances on food policy as major debates carrying tremendous influence on election day. Food impacts all, and it cannot be a side issue. He challenged the audience to leverage our collective voices to have an impact on Washington. Colicchio then introduced arguably the most successful restauranteur in the U.S., Danny Meyer. Starting with one small cafe in Union Square, Danny Meyer built a global food empire including iconic brands such as Shake Shack, Gramercy Tavern, and Union Square Hospitality Group. Over the past 35 years Meyer opened dozens of successful concepts, won James Beard Awards, and published renowned books. However, with success and scale, Meyer has not compromised his mission of transforming his restaurants into extensions of the community. As a restauranteur he stressed that he has a greater responsibility than profits. Restaurants provide a sense of place making in the community. Meyer reminisced about traveling throughout different regions in France and Italy saying "what you ate tasted like where you were." The flavors and atmosphere of a restaurant must be drawn from the environment that surrounds them. Without this connection a restaurant becomes an empty shell, and its food has no deeper meaning. Meyer closed with a symbolic anecdote on the origin of restaurants. He explained how the word restaurant, is a french term meaning to restore. This notion of restoration must not be lost. The role of women in food and farming was also a major theme that drew tremendous engagement at TEDxMan. Michele Merkel, lawyer, food system sustainability activist, and Director of Food & Water Justice, gave an emotionally charged talk on her battle with Big Ag over the detrimental pollution caused by concentrated animal feeding operations (CAFOs), from the industrial meat and dairy industry. She explained that with the power that Big Ag has over the industry, many people feel powerless or have a sense of emotional disconnect with food. However she emphasized that every consumer makes an impact. Merkel expressed that "people must be transformed from passive eaters to informed shoppers," and that " eating is a moral act." It was this sense of individual responsibility and call to action that really resonated throughout this incredible day. TEDxMan was a very charging experience for the UP team, because it illustrates that we are not alone in our mission. In fact, it demonstrates that we are apart of a burgeoning global movement led by bright, multidisciplinary minds that will redefine the way food is produced and consumed. This food revolution can be seen from all corners of the globe, and we see it here in Baltimore everyday. Whether it is activists protecting the Chesapeake, restauranteurs showcasing local ingredients, or the local government creating legislation to support urban agriculture, change is happening all around us. We hope to be one of many that will help rebuild our community through good honest food. The UPC team had an incredible opportunity to participate in the 2015 Agritecture Workshop on behalf of the Association for Vertical Farming. The workshop was held at Columbia University in New York, and it attracted a passionate group of scientists, engineers, designers, architects, and entrepreneurs from around the globe who seek to use urban agriculture as a vehicle for social, economic, and environmental change. The event began with remarks from Dickson Despommier, author of the Vertical Farm. Despommier is widely regarded as the father of the movement, and was an immense inspiration for the UPC team and many other aspiring urban agricultural entrepreneurs across the globe. Despommier spoke about the inception of this idea in the walls of his Columbia classroom, and how it has blossomed into a global movement. Urban agriculture is the future of food production, and innovation in this field is of vital importance to the resiliency of our cities. Three multidisciplinary teams were formed and given 24 hours to build a feasible model including architectural renderings, business plan, and financials for an urban agricultural development in 12 locations across the NY. Julie's team selected a brown field site owned by the National Grid company for the purpose of remediation. J.J.'s team selected a site in Far Rockaway, a community that was nearly destroyed by Hurricane Sandy. All groups utilized a mix of innovative technology, ecological processes, and community development strategies to help empower these downtrodden communities. Below is a video of the "Rockaway Collective," team, pitching their concept to a group of industry experts and venture Capitalists. The UPC team was incredibly honored to participate in a special event with such an amazing group of brilliant minds. We would like to extend a special thanks to our hosts, Henry Gordon-Smith, Founder of Agritecture, and Max Loessl, Founder of the Association for Vertical Farming. Similar to Tesla, Henry and Max are collecting invaluable industry data and building an open source database tool to share with the planet in order to progress the industry forward. As we strive to build a more sustainable future for our planet, we must unite and facilitate innovative collaboration. As our friends at the AVF and Agritecture say, "keep growing." UPC is in the process of working with real estate developers and local government entities to locate an ideal space for our operations. UPC has the versatility to act as both an anchor institution and a production facility. Our vision is a combined production and retail concept that is woven into the fabric of the Baltimore community. Last Week, the UPC team had the opportunity to visit the Cylburn Aquaponics Farm, operated by the Johns Hopkins Bloomberg School of Public Health. The project was developed by experts from renowned food systems think tank, The Center for a Livable Future (CLF). This initiative is spearheaded by aquaculture expert Dave Love, and farm manager, Laura Genello. Cylburn acts as both a research lab and an educational farm for the community. The farms hosts anyone from school age children to commercial growers interested in alternative growing methods. The CLF also offers a summer program, that acts as a crash course in aquaponic growing. UPC is arranging to partner with Cylburn and the CLF to test our vertical growing methods and various crop varietals in their greenhouse. Consumer education and interaction are vital as we grow our company. This opportunity will provide valuable insight into how the community interacts with our product. UPC is excited to work with Laura and the CLF to test our vertical growing methods and learn from their wealth of expertise in the field. Urban Pastoral Collective was selected to be one of the 12 teams to join the 2014-2015 cohort of entrepreneurs at the Johns Hopkins, Social Innovation Lab. The cohort consists of a multidisciplinary group of Hopkins' best and brightest student innovators who seek to solve significant social, environmental, and economic issues. Social Innovation Lab is led by Director, Darius Graham, and supported by the office of President Ronald J. Daniels. The incubator will culminate in March with a Demo Day, where the SIL teams will showcase their prototypes to the community. UPC is excited for their partnership with SIL, and looks forward to pursing their mission to redefine farming. The UPC team had the opportunity to present our concept to a group of social impact investors at the Johns Hopkins Innovation Factory Summit at the end of September. Entrepreneurs from a diverse range of backgrounds shared exciting business models ranging from mobile health and cancer diagnostics, to web applications and urban development. UPC received immense interest from the audience of burgeoning entrepreneurs, industry leaders, and investors, and is proceeding through the due diligence phase with several potential partners. Co-founders, J.J. and Julie also had an interview with the Baltimore Sun to share their vision of feeding America's cities through urban agricultural production. Walking out of Johns Hopkins Carey Business School, where the Innovation Summit was held, the team stumbled upon the StartUp Maryland Pitch Bus, and was ushered on to give a 2.5 minute pitch on the fly. 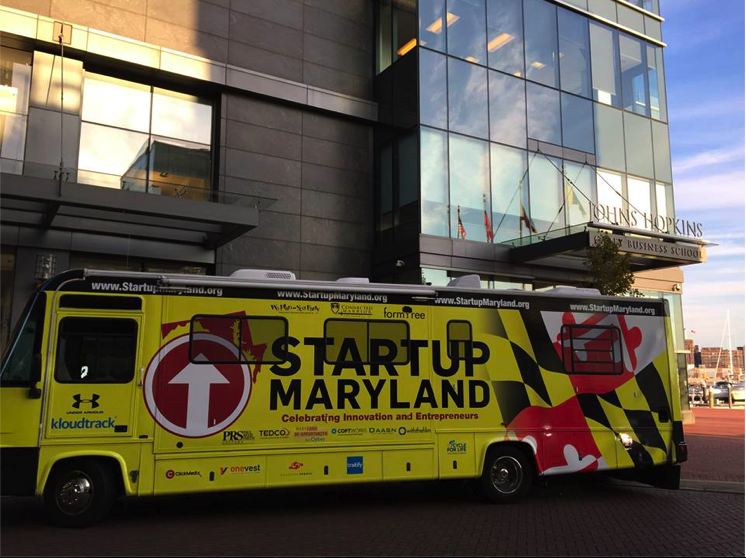 StartUp Maryland Launched a campaign, Pitch Across Maryland, where they drive their bright yellow bus across the state to various innovation hubs, to connect with Maryland's best and brightest entrepreneurs. Entrepreneurs are thrown into the hot seat in front of cameras and reporters, and are challenged to pitch their concept in less than 3 minutes. This initiative is a part of an overarching mission to spur entrepreneurial innovation across Maryland. Michael Binko, founder and president of Startup Maryland provided his outlook in a press release today. "The diversity of industries and innovations was once again impressive and inspiring. We now begin the two separate competitions that define the next stage of the Pitch Across Maryland. The first competition is something fun we refer to as the Fan Favorite and the second competition will reveal our Great 8 Finalists." The "Great 8 Finalist" will then have the opportunity to pitch their concepts at the TEDCO Entrepreneur Expo and the 2 winners will have the opportunity to compete for $100,000 grants through the Invest Maryland Challenge.